a basic play (suji) wedging into a one-point jump. See below. a play on the side that leaves room to extend to either side. See splitting move. There are many wedge variants. A move wedging between two enemy stones. BobMcGuigan The move above is also an example of hanekomi, a warikomi which is, at the same time, a hane. 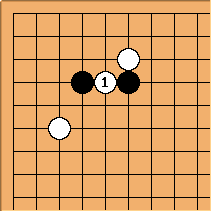 This example is from the tesuji dictionary by Segoe Kensaku and Go Seigen. I was taught that it is to your disadvantage to play between two stones separated by 1 space. I followed this rule to discover later that this is not always true and as the stones appear on both sides of the one-point jump formation you have to consider seriously a probability of a cut. At some point the motto of the day was "Check your connections". Get good connections, trust your connections but check them.